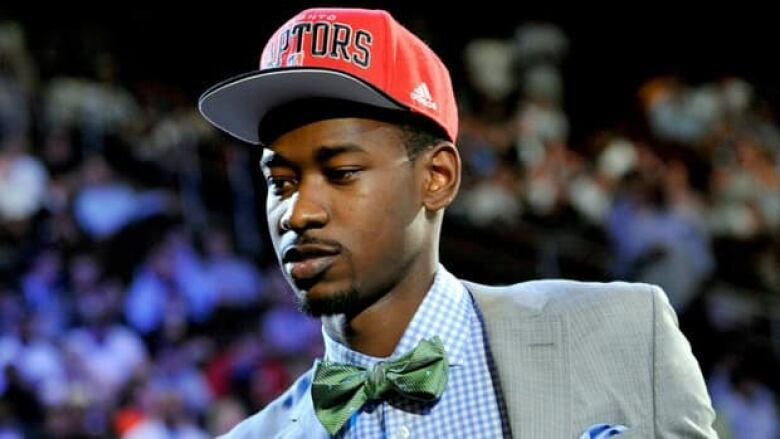 Toronto Raptors' first-round draft pick Terrence Ross arrived at Air Canada Centre on Friday wearing his new team's cap on his head and a smile on his face. Flanked by second-round pick Quincy Acy, the Portland native shared some rumours he's been hearing about Toronto. Terrence Ross refused to let an early-morning flight and an airport delay dampen his spirits. The Toronto Raptors' first-round draft pick arrived at Air Canada Centre on Friday wearing his new team's cap on his head and a smile on his face. Flanked by second-round pick Quincy Acy, the Portland native shared some rumours he's been hearing about Toronto. "When I ask other guys who work out here, they say it's by far the best city in the league right now," Ross said. "It's real diverse, a lot of people are friendly, I just love it out here." The Raptors selected the University of Washington product eighth overall before taking Acy with the 37th pick on Thursday night. But even though Ross averaged 16 points per game last season, Raptors general manager Bryan Colangelo surprised most NBA pundits by picking him so early. Ross, at six foot seven, 195 pounds, was slated to be outside the top 10 in most pre-draft projections, but he won over the coaching staff with his shot-making ability and his defensive prowess. Head coach Dwayne Casey suggested Ross could complement guard and top scorer DeMar DeRozan next season. Ross expressed his excitement about playing with the "freak athlete." Colangelo denied that Ross was a surprise pick, claiming he followed the guard's progress with the Huskies all season. He said Ross was also very impressive during his workout in Toronto earlier this month, where he drew praise from many current Raptors. "Terrence was always listed for consideration at the eighth spot," Colangelo said. "You don't worry about where you're drafting, you're worried about what piece best fits your organization. "We felt that Terrence was that guy." Acy, a 6-7, 244-pound forward, might not have the same offensive presence as Ross, but the Raptors liked his strength, intensity and his defensive ability. He'll be the first player to wear No. 4 on his jersey since Chris Bosh left to join Miami. Colangelo and Casey both compared him to former Raptor and current Los Angeles Clipper Reggie Evans, who's known for his aggressiveness and rebounding ability. But Colangelo joked that he expects more from Acy. "He's Reggie Evans with a scoring touch." Acy also drew some laughs when he acknowledged most Canadians' favourite sport. "We're in Canada now, so think of me as a hockey player on the basketball floor," he said. "I'll make tough plays and compete." Colangelo said both players suit a young team that underwent a "culture shift" last season, when Casey focused on developing a more defensive-minded team. "Athleticism, talent, basketball acumen — both of these young men will bring a tremendous amount to what we're trying to accomplish here in shaping the composition of this roster," said Colangelo, adding that he expects Ross and Acy are both team players. "You're talking about two hard-working, high-character young men that have very good basketball skills and a high level of talent." Casey was also impressed with both players' ability to transition from defence to offence, an area where the Raptors are looking to improve next season. The two draft picks won't be the only new players coming to training camp next season. The Raptors selected 6-11 Croatian Tomislav Zubcic 56th overall. He'll join Lithuanian centre Jonas Valanciunas, taken fifth overall in 2011, who averaged 14.2 points and 7.4 rebounds in more than 23 minutes per game for Lietuvos Rytas in the Lithuanian league this year. The Raptors were criticized for picking the Valanciunas last year, but many scouts said he would have been the second pick on Thursday night. Colangelo, who flew down to Houston last week to watch the 20-year-old work out with the Lithuanian national team ahead of next month's Olympic qualifying tournament, said the coaching staff is excited with his progress. Colangelo also announced that he extended qualifying offers to restricted free agents guard Jerryd Bayless and guard-forward Sonny Weems on Friday. Both will become restricted free agents when free agency opens on Sunday. Colangelo promised to be active on the market, adding moves in the coming weeks will be crucial in determine how the Raptors look come October.